Tina Li was born and raised in Honolulu, where she graduated from President William McKinley High School. 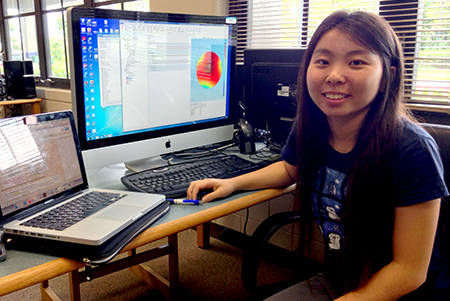 She currently attends the University of Hawai‘i at Ma?noa, pursing a Bachelor of Science degree in Mechanical Engineering. After graduating, she would like to attend graduate school. One day she would like to work in the biomechanics industry. In her spare time, Tina enjoys watching movies, reading, eating, and spending time with family and friends. Project Abstract: The Institute for Astronomy is currently working on a project called ‘Imaka, which is a ground-layer adaptive optics (GLAO) system for the 2.2-meter telescope on Mauna Kea aiming for high resolution, high sensitivity, and a large field of view using relatively large mirrors. Due to the size and weight of large mirrors, gravity causes deflections in the mirror surface that will distort the output images. The design of a mount for large mirrors has to be carefully considered in order to support the mirror and reduce self-weight deflection. Mirror surface deflections were calculated using COMSOL, a finite element analysis (FEA) software, for various mounting designs. A simply-supported ring mount, a fixed ring mount, and a 3-point mount were modeled for a solid Borofloat33 glass mirror with a 400-mm diameter and 50-mm thickness. Model results were compared with analytical solutions to gain modeling skills and understanding of the software and the limitations of both the FEA and analytical models. For the ring mount, both simply-supported and fixed, there was a 3% difference between the FEA and analytical solutions (taking into account bending and shear stresses). As the aspect ratio of the mirror increases, bending stress dominates the deflection and shear stress becomes negligible for both the ring and 3-point mounts. Verification of basic mounts and understanding of FEA in COMSOL will facilitate the design and analysis of the more complex mounts that will be needed to support the ‘Imaka project’s mirrors.